Specifically designed to receive and demodulate DTV/HDTV transmissions from reflected broadcast signals, the SquareShooter is uniquely suited for urban/metropolitan locations where line-of-sight to the transmit source is blocked. 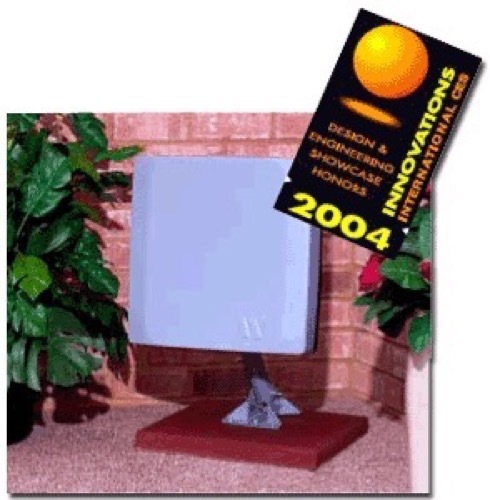 This 15" square antenna can receive and demodulate clear analog broadcast signals up to 45 miles and outstanding DTV/HDTV signals over 50 miles from the transmit source and is ideal for the suburban market. Please note: This antenna may not work in some areas for viewing channels 2-6. Because of its size and versatile installation options, it can be mounted practically anywhere for the best DTV / HDTV reception such as on walls, fascias, roofs, patios, attics, or railings. With the addition of our DS-1000 or DS-1111 pole mount (must be purchased separately), which meets DirecTV and Dish Networks wind load requirements, the SquareShooter antenna can be mounted above a satellite dish and diplexed (diplexers sold separately) with the satellite system to incorporate satellite and Off-Air signals onto one coax cable. 50' of Coax Cable Supplied Free!! !